In Oxford snowdrops and early daffodils are blooming already but in Borås, Sweden the lakes are still frozen and ground is sprinkled with snow. What brought me there was the third – and last – DiXiT Camp. These half-yearly gatherings are not only occasions to bring fellows together for our supervisory meetings but they are foremost dense-packed with lectures, presentations and hands-on sessions on various topics. Keywords for this week were: academia, cultural heritage, society. I have to admit I gave barely a glance to our schedule so on Monday morning I was quite surprised when, after a brief lecture on the public of scholarly editions and consequences it should have as we create one, we were asked by Elena Pierazzo to design user interface for a web app. In 30 minutes we barely got our act together to decide what we wanted our app to actually do, let alone thoroughly design the interface for it, but we have had some interesting ideas and definitely enjoyed the experience. But the best was yet to come. After lunch José Miguel Vieira from King’s College Digital Humanities Department greeted us with detailed tutorials that led us through initial stages of creating an app for Android devices with MIT’s AppInventor. For quite a while our group of supposedly mature professionals behaved like children delighted with a new toy. Next step – obviously – was to try the newly-gained technological superpowers to play pranks and shout mild abuse at our peers before we finally moved on to business of enhancing our shiny and new digital edition app with adequate functionality. The time flew by and workshop ended way before we wanted it to, leaving most of us with a strong resolution to try something on our own. 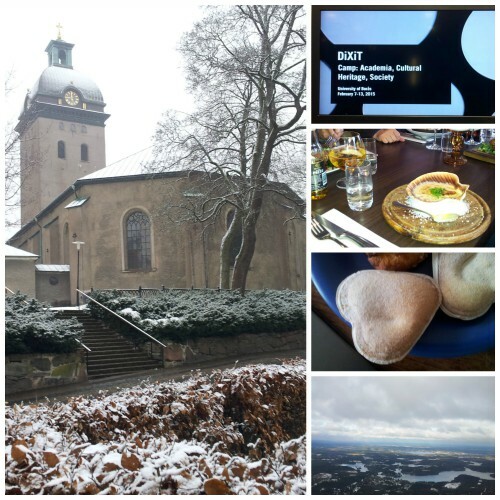 Next two days were dedicated to practical aspects of digitisation process – foremost the mass-scale creation of digital facsimile images and led by a team from National Library of Sweden. We had a number of introductory talks on selection, information capture and processing on Tuesday but Wednesday morning we were again on our own with a goodie-bag that contained rather unusual collection of items: from Hello Kitty magazine with stickers and necklace, through maps and contemporary newspapers to a historical daguerreotype in a handsome engraved case. We tried to put our librarian-archivist hats on and think about how to proceed when digitizing not only this relatively small though extremely mixed set, but how would we deal with thousands of objects like these. Again, discussion was pretty interesting and we even decided to create some video footage of opening the Hello Kitty bag for posteriority, but only the afternoon session put our vague and abstract divagations to the real test. We were given a digital camera, fancy table to mount it on, very interesting but necessarily brief introduction to practical aspects of digital photography and it was time to shoot! For those of us, who – like me – were barely skilled in taking pictures with mobile phones it was both challenging and illuminating to hear about concepts like depth of field, exposure, scene lighting or white balance (especially as it turned out to be grey balance in the end). Our tutor, Andrea Davis Kronlund, did a perfect job explaining it very clearly and showing everything in action straight away. Thus armed we were quite keen on applying all this in practice – keeping the light even, avoiding vibrations, carefully calibrating and adjusting the tiny details to ensure the best consistency across the shoots and minimizing the need for manual post-processing of our images. Our afternoon ended with general discussion that wrapped-up nicely the two days we dedicated to digitization problems and techniques. 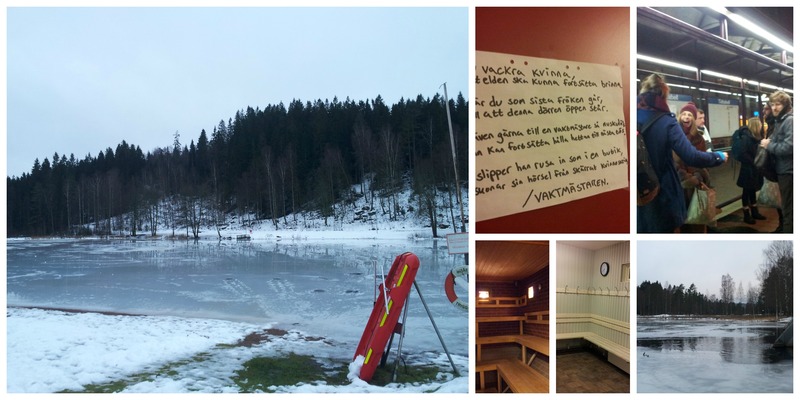 It was the end of the DiXiT part of the workshop for me with a small exception of the ultimate Swedish cultural experience – the ice baths. In 6am winter darkness we ventured forth to warm ourselves in the sauna and then rapidly cool in the freezing waters of a lake covered with ice – bar an opening only about 10 metres across. I rather recommend it to anyone tough enough as getting back to the safety of the bank after a very brisk swim in the lake definitely makes one feel very much alive. 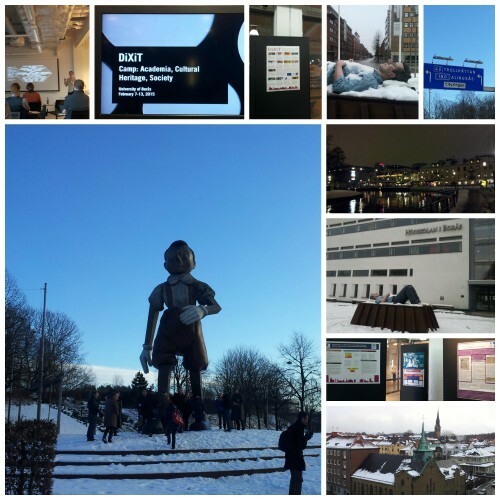 My colleagues ventured forth to hear about digital asset management while I had to be back in time for the 2-day workshop for international masters students of Library and Information Science School dedicated to TEI and related XML technologies organized by Mikael Gunnarsson. In this short time we covered rather a lot of ground – starting with general introduction to what a scholarly edition is and what digital scholarly edition should be, through basics of XML, the idea of TEI, its core elements, popular modules and principles of dealing with metadata, to finish with XPath, XSLT and ways of using that data not only in textual manner but as input for all sorts of visualisations. All these concepts are a real challenge, especially at first sight and not easy to teach as well so it was my great pleasure to see Swedish students eager to get their foundations straight and solid and build from there for our grand finale with XSLT. That’s quite a journey in two days, well done! All teaching materials from masters course are available here. Borås camp was indeed special – interesting training was to be expected, but the wow factor came from the city itself – unique settings of Textile Fashion Center, numerous sculptures found unexpectedly in the streets, harsh climate and hot fika… Many thanks we owe to camp organizers Mats Dahlström and above all our own Merisa Martinez for warm and generous hospitality from pre-dawn darkness to the wee hours. This is a lady that delivers and I’m looking forward to her own perspective on Borås camp, hoping it will include her brilliant video coverage. Hejdå!